In keeping with my regular pattern of combing extensive international travel with early starts for wargaming weekend, the 630am departure for Usk along a near-frozen M4 came cold on the heels of a return from holiday in Florida just 2 days before. Erm�. That was about it really. The draw set up a tantalising first round matchup in which we would face the might of the only Francophone team in the event, all the way from Belgium to the Pays du Galles. Their choice was a doubles classic � Ottoman and Serbian. The lists for the French Ordonnance & Italian Condotta and Ottomans & Serbs from this game, as well as all the other lists from the games at Godendag can be seen here in the L'Art de la Guerre Wiki. The armies set themselves up on table � a first for our combination which had never previously been deployed. Luckily it appeared to cover most of the board, meaning that our opportunity for clever manoeuvres that we would undoubtedly get wrong was quite severely curtailed. The table was dominated by some interesting terrain, with a field made of Rough Going in the middle, and a plantation just off to our right. 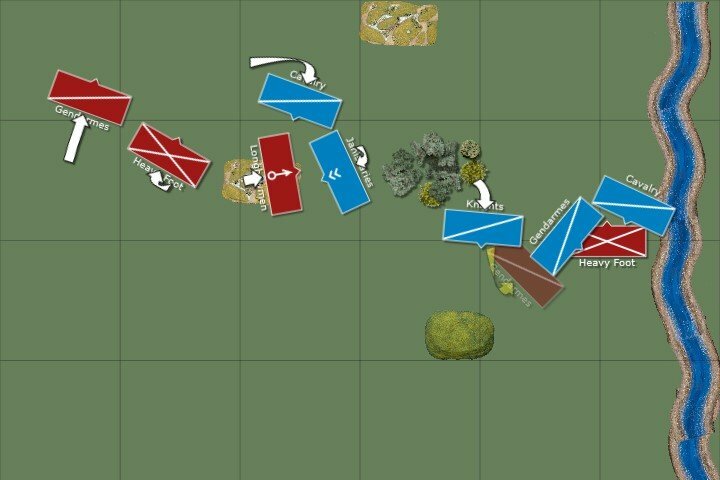 The field looked like an obvious place for the Janissary bowmen to go, and so we faced their likely � and actual � deployment off with the Almughavar command and also our Longbowmen, hoping to use our rough terrain specialists to rush the Ottomans and both shoot and cut them down before they could do too much damage. With heavy foot on either flank, and then knights outflanking them the trap was complete. On the flank (see, I did take some photos of Simons side of the board) a solid line of knights and heavy foot moved to block off the gap between the woodland on the coast and the central plantation. The Serbs would have a real challenge breaking through this line, stiffened as it was with a sprinkling of Pikes. On our extreme flank a scattering of handgunners planned their slow retreat into the woods in the face of superior enemy numbers. 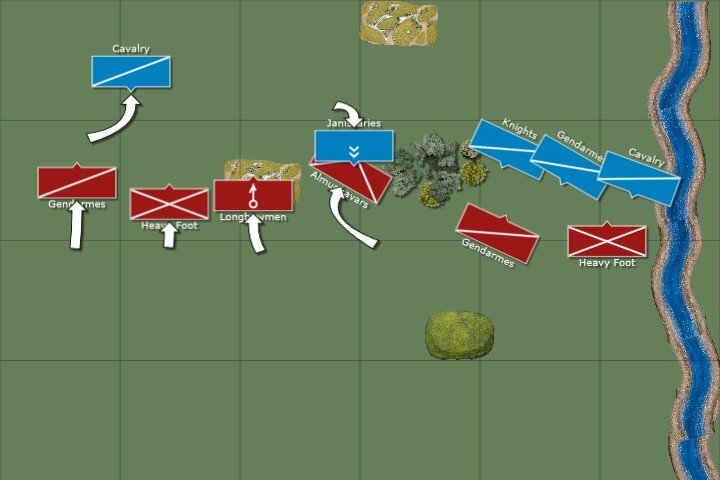 LArt de la Guerre hint� Light Foot can easily be run down in the open (as in, they are just instantly removed when contacted by a charge of heavier troops), but become much tougher to shift once they are in terrain. The Janissaries clearly knew something we didn�t, as they sat waiting expectantly as far greater numbers of our troops, from 2 separate commands, bore down on them across the uneven field. The Italian/French army is pushing forwards along a broad frontage whilst the Serbian knights are massing against the smaller numbers of Italian/French knights on the left. Back on the left, our knights advanced slowly, careful not to outdistance their associated foot as this may allow the sneaky Ottomans to insert some flank pressure on them. They also needed to be mindful of shooting casualties as the Ottoman horse hurled dice and arrows at them from distance. French-paid Longbowmen (from Old Glory) began to test their bowstrings as the Ottomans brought up some quality Horse to try and persuade them to stay in the terrain, whilst the Almughavars and supporting swordsmen ploughed a straight furrow across the field towards the Janissaries. LArt de la Guerre hint� Impetuous troops who are in charge range have three options � pay pips to charge under command (usually 1, zero if charging from less than 40mm, of 2 if they are turning and charging), pay 3 pips to halt or move and not go into contact, or charge impetuously for free (which gives a -1 combat factor in the first round for uncontrolled charge). 3 pips is quite a lot when you are rolling a D6, adding your command value of 0-2 and then halving the result�. The Almughavars were almost in - and were still fully coherent (as in no cohesion markers, and so no minuses in combat � they may still have slurred some of their words due to a heavy night in the tavern before the battle). Even with some poor quality bowmen on the Almughavars flank this looked good, as the Italian LF could surely hold them off in the terrain whilst the Almughavars and swordsmen did their business? The Italian/French army has committed the Almughavar command against the Janissaries, but the cavalry on the left have largely taken 1/3 of the Italian/French forces out of the game. This is an Almughavar in combat! 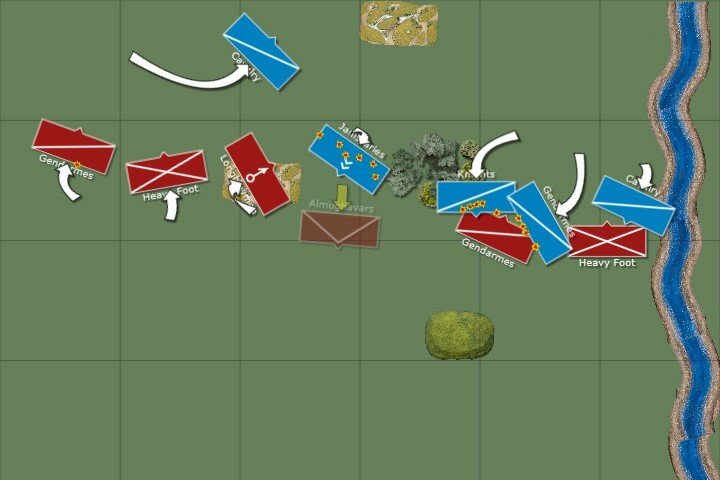 Maintaining the suspense for a while longer, on the left the Italian knights charged forwards, forcing the Sipahis to evade. The Knights had suffered a few cohesion losses but the Ottomans still not dare stand up to their fearsome charge (and better armour in combat). On the right the rest of the knights were still being kept on a short leash as the two sets of skirmishers retreated out of the way. Back to the fun stuff, and the Almughavars traded blows with the Ottomans, coming off slightly better � as one would expect because of their extra �impact� factor � out of the initial clash. In melee things would be much more even as the sword-armed Janissaries could go toe to toe with the Catalans quite happily. Holes appeared quickly in both lines, making a Franco-Turkish cheese metaphor in the process, and markers spring up across the plantation as the two sides fought manfully to try and wrestle an advantage in the crucial middle section of the battlefield. Meanwhile, things were springing into life all across the field of battle, as the Serbs crashed into the Frenchmen � but inspired by the forthcoming Australian Open tennis no doubt, the 4 horsemen of the Djokavic quickly gained the upper hand and punched a hole right through the French line. Desperate to keep the flanks of the Janissaries safe, and probably sick of being peppered with longbow arrows with no real means of reply, the Sipahis in the centre had piled into the Longbowmen who were temptingly just in the open ground. This allowed the Longbows to swing forwards and then turn onto the flan of the Sipahis, causing a decisive advantage to occur. 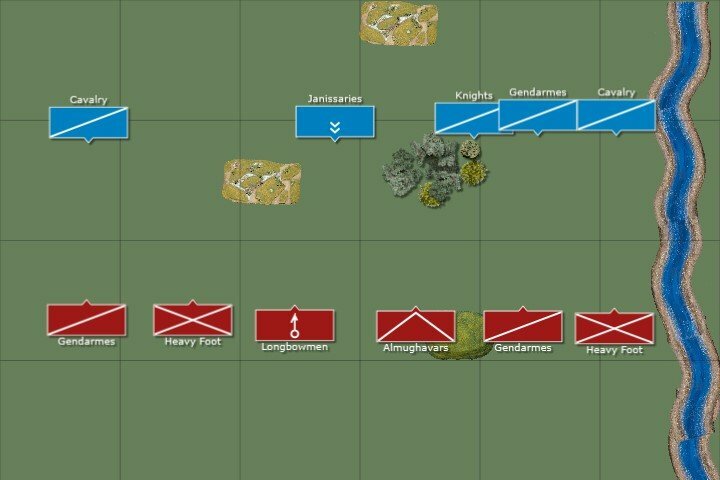 LArt de la Guerre hint� the flanking combat rules can be a source of confusion, but are actually quite simple. Hit someone on the flank who is not engaged to their front and they fight at a base factor of zero, you get +1 for contacting a flank, but they don�t immediately lose a cohesion point. Hit someone on the flank who is already fighting to their front and they instantly lose a cohesion point, fight at a base factor of zero, and their frontal opponent also gains a +1 for �support�. 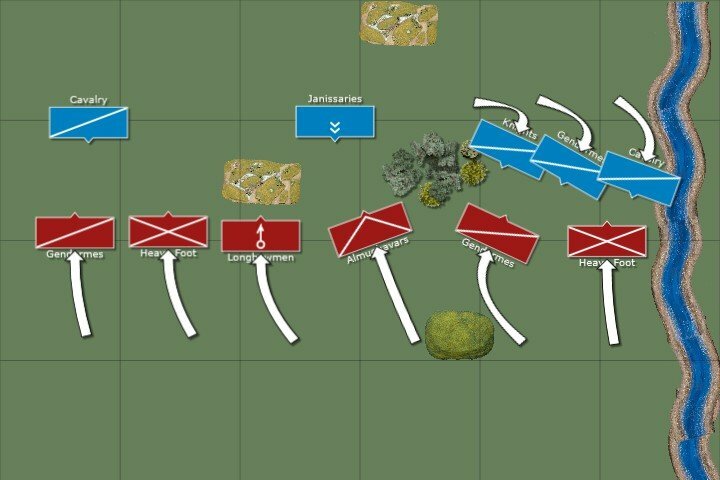 The Sipahis had clearly not read these rules in their entirety, and so ended up comprehensively out-dicing the Longbowmen and chewing a big hole in their formation! The Almughavars are about to be swept away by the Janissaries and as more Ottoman Sipahis join in the fight extends to the Longbowmen in the Italian/French army. Weight of numbers is seeing the Serbian Knights break through the Italian/French forces facing them. On the right flank the clash of two lines of knights had forced the Italian foot into a more ambitious frame of mind, and poor quality pikemen were now advancing unwisely towards a Serbian skirmish screen, hoping to drive away the enemy LH crossbowmen and prevent their irritating archery from doing any lasting damage. The Serbian knights needed no assistance and were starting to turn and plan their roll-up of the French chivalric line. The Janissaries too were fighting back strongly, and the Almughavar command found itself whittled away under a hail of Turkish swordsmanship. This had not gone to plan, as the initial Impact POA (factor..?) had failed to prove decisive. On the far left the Turks had been scattered to the four winds, but in so doing they had failed to concede any casualties to the advancing Italian knights who were now broken up as they were forced to leave behind some of their more badly arrow-impacted colleagues. The alternative would have meant risking some death and base removal from successive cohesion drops to the sustained evading and shooting tactics of the Turkish horsemen. The right flank was turning into a blur of motion, but the motion was all about the Serbs rolling up the French unfortunately as the knights continued to break through and slam into the French flanks. Soon the Italian infantry command were drawn into the fight, as the Serbs ran out of knights to chew up! The Longbow/janissary battle had exhausted both sides, and they took time to regroup and face up as a French halberdier and an Ottoman Sipahi, both of whom had been drawn into the combat, found themselves the centre of attention � much to their own great surprise! "That Guy's got an axe stuck in his helmet! That means someone is without a weapon!!" The Serbian Knights complete the destruction of the French/Italian right whilst the victorious Janissaries clean up the remnants in the centre. The game is done. Aaaarh! This has been a rough and ready awakening on an early Welsh morning - there will no doubt be sheep roaming these hills who have experienced far worse but from where I currently sit, at the foot of the table and facing the prospect of a bacon sandwich with more fat than pigmeat for lunch this looks to be a long weekend for myself and my plodding army of flank-ignoring buffoons. I would like to think that I learnt much from this game, but that is probably limited to recognising that Ottomans & Serbs are a solid choice and perhaps I should look to recruit some Janissaries into my army instead of these half-hearted Englishmen and their supposedly superior bows? At least we will start the next game from the bottom of the pile. Which, strangely enough, reminds me that I need to warn my valet to be a little more careful when helping me on with my undergarments as he dresses me for my next battle this afternoon. What foolishness is this analysis? If brains were grain, thou wouldst not have sufficient quantity to feed thy fat whore ! 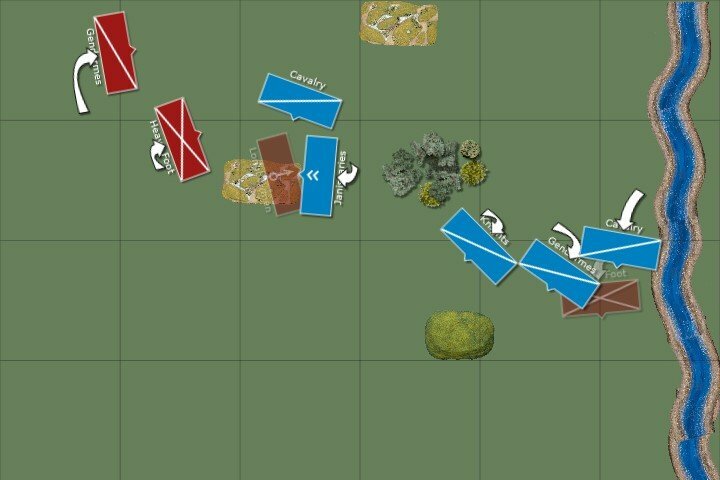 You were roundly beaten by someone making the most basic of tactical approaches involving walking through rough terrain that you had not defended, and turning your flank to roll up your best troops. And what sort of albatross-biting buffoon allows two of his 6 commands to be skirmished out of the game, and in fact positively sits up and begs for it by placing them so far out on a flank that they are practically deployed in Hererfordshire? The Gendarmes and Infantry had no chance of getting into this game, and so the matchup was already 5:4 against you from the start, perhaps even more by the time that you look at points values! Only a boil-brained cretin such as you could make such a mistake, and then even more pathetically would compound it by attacking the Janissaries with no idea what capabilities they owned! Sword-armed bowmen are a unique troop type in ADLG, but Janissaries are an obvious candidate for eminence - perhaps if you had opened the lists this failure could have been avoided?